Gov. 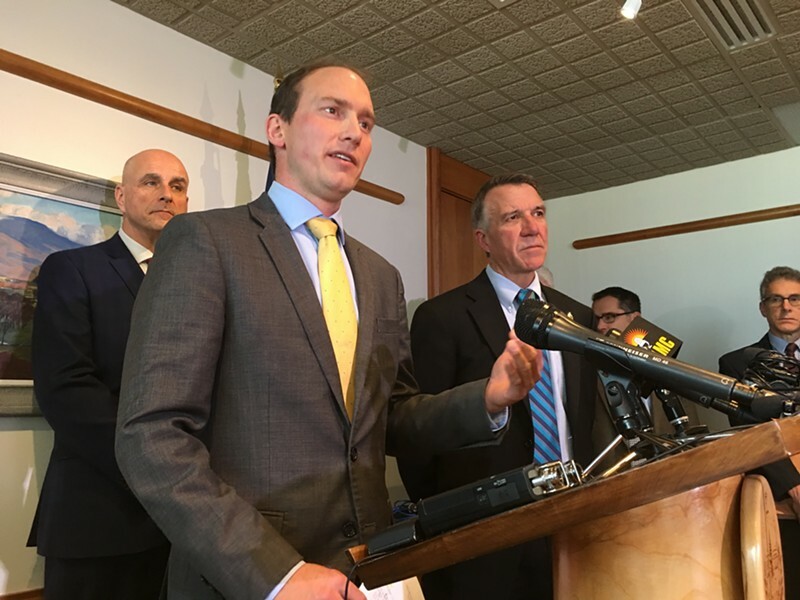 Phil Scott held a press conference Wednesday afternoon that his office promised would "detail" his plan for spending the state's share of funds from Volkswagen's legal settlement for cheating emission tests. The event itself was short on detail and provided only the bare bones of an actual plan, leaving many crucial issues wide open. Vermont is expected to receive $18.7 million over the next three years from the national fund. The money is supposed to help reduce nitrous oxide emissions from diesel-powered vehicles. Within that broad mission, it can be spent in a number of ways. On Wednesday, the administration announced three broad principles for spending the money, and a general outline of which transportation sectors would be eligible to apply for VW settlement funding. The full proposal is available on the Agency of Natural Resources website. Some background: The $18.7 million cannot be spent on personal or private vehicles — it's devoted to industrial and commercial vehicles such as trucks, buses, construction equipment, ferries, tugboats, and service vehicles used at airports and rail yards. The money can be spent on replacing diesel vehicles with electric ones, or replacing older diesel vehicles with modern, cleaner diesel engines. And up to 15 percent of the fund can be spent on electric-vehicle charging infrastructure. "Our plan has three goals," explained Natural Resources Deputy Secretary Peter Walke. "One, to reduce [nitrous oxide] emissions in a cost-effective manner. Two, to demonstrate market viability of all electric and other alternatively fueled vehicles. And three, to maximize public and private investment in electric vehicles and charging infrastructure." The administration also proposed to split the $18.7 million four ways: the maximum 15 percent for electric vehicle charging stations, 43 percent for on-road heavy-duty vehicles (basically, trucks or buses), 31 percent for non-road diesels including forklifts and airport equipment, and 11 percent for rail and marine vehicles. Neither Scott nor Walke expressed a preference for replacing diesels with electric-powered vehicles — a potential point of dispute with environmental groups, who say electrics are a better long-term investment. "There are many different fuel options," said Walke. "There's compressed natural gas, there's propane, and also the modern version of the diesel engine is considerably cleaner than past versions." Scott hinted at a preference for clean diesel over electric. "As time goes on, electric vehicles will probably come down in price and become more reasonable. So do you do that investment up front, or toward the end?" he said. "The technology changes so quickly." There won't be a preference for public sector investments, although it could be argued that buying new equipment for local or state governments would give taxpayers a bit of a break. "Both governmental and non-governmental entities are eligible as part of the process," said Walke. "The vagueness in the plan is problematic," said Sarah Wolfe, clean energy advocate for the Vermont Public Interest Research Group. "Focusing on one area would make a greater impact." VPIRG has proposed devoting 15 percent to electric charging infrastructure and spending the remaining 85 percent on electric school buses. "It’s important to invest these one-time funds in clean, fossil-fuel free technologies," said Brian Shupe, executive director of the Vermont Natural Resources Council. "'Clean' diesel is not clean, and it squanders a good opportunity to use these funds to create a more clean, 21st century transportation system." Members of the legislature's Joint Energy Committee plan to introduce a resolution supporting VPIRG's proposal, but lawmakers won't have any direct influence over the final plan. "We've had lots of conversations with the legislature about what they're interested in, but in terms of a specific role, I don't see one," said Walke. "We're interested in hearing not only the legislature's opinion, but also all Vermonters'." The administration will accept public comment on the plan through January 13. After that, the plan will be finalized and submitted to the trustee overseeing the Volkswagen fund. If the trustee approves Vermont's plan, the state can begin the accepting proposals for the money. That procedure has yet to be designed, and Walke had no idea how long it might take to start putting the money to actual use.